I give the new update three Twilights out of ten. Which, thanks to the new bugs in the game, you can actually see while playing. Gameloft has delivered a major update to their iOS/Android game, My Little Pony: Friendship is Magic. I guess that means I should update my review for that game. Looking back at my original review, I wonder how I could have given this game a 7 out of 10. Maybe I was running high on the magic fumes of friendship at the moment. The game clearly deserves to be docked a few points for being a blatant cashgrab. In order to keep people interested in the game, they’ve been adding new characters, at the rate of about three per month. The new characters are basically the old characters, just painted different colors. The new characters don’t affect the plot of the game, unless they are expensive, in which case it becomes mandatory to purchase them. Needless to say, none of these characters have been featured in the actual TV show. Now we have a major update to the game. It is vaguely based off of the Season 2 finale, and it features a brand new location! That’s right, you can now leave Ponyville and take the train to Canterlot! …Only Canterlot is exactly the same as Ponyville, just painted a different color. 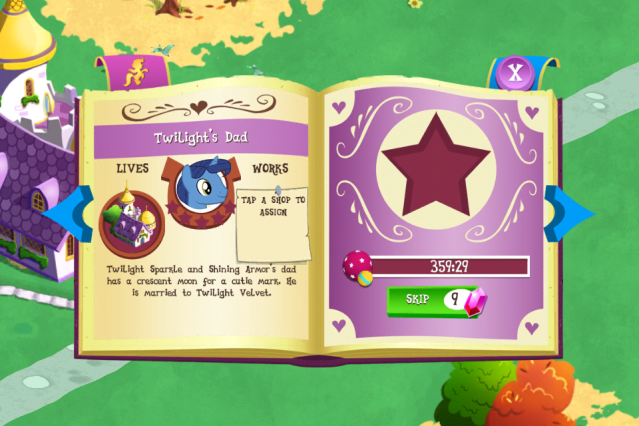 Twilight’s Dad now has an official name: Twilight’s Dad. The new Canterlot location is big and lonely. It’s big, because they want you to pay money to unlock the full town map. It’s lonely, because they added as little new material as possible. There are nine new characters and five buildings, most of which are the old ones, painted a different color. Let me put this in perspective. If you bought all of the brand new material–not that you could afford it–and put it in the new location, it would fill up about 10% of the board. The rest is just empty space which does nothing. I feel no need to unlock these areas, because there is nothing there, and I have nothing to put there. This leads to another problem with the update. Now that the game has two separate locations, it has two separate inventories. It’s an adventure game nightmare gone horribly wrong, because items cannot be transferred from one inventory to another. Most of the time, the forced inventory separation works fine, but it does make you question why the ponies cannot take items along with them, when they travel on the train. And why does Location A sell items that can only be used in Location B, anyway? I finished with the new area in about twenty minutes, before I hit the upper limit where I’d have to spend real money to progress. So…yeah. I give the new update three Twilights out of ten. Which, thanks to the new bugs in the game, you can actually see while playing. You have to love updates which add glitches, instead of removing them. Clearly the magic of friendship encouraged you to make a rather high score for this game before. To be honest though, I have played this game before this supposed update, and I found it rather boring after a while. If your looking for a fun game to play though, I would suggest Clash of Clans. I might actually post something later in the month about it. Has Michael Gray been replaced in the world of GameFAQs?